The story of Dara, the newest production to take to the boards at the National Theatre, is one that begins thousands of miles away from the concrete jungle of London’s South Bank. It is a play that made its debut four years ago in the Pakistani city of Lahore, before being seen in Karachi, Islamabad and all across India. It dramatises the true story of Shah Jehan, the Mughal emperor famous for building the Taj Mahal, and the victory of his radical elder son Aurangzeb over his moderate and liberal younger brother, Dara Shikoh, to succeed him. It is a unique production for the National to stage, the first time it has taken an original south Asian production and both translated and adapted it for a British audience. The journey of collaboration between the Pakistani playwright Shahid Nadeem, his theatre company Ajoka and the National took four years to complete. The decision to stage the production came out of series of discussions inspired by the controversy and accusations of racism and racial stereotyping levelled at the theatre’s 2009 play England People Very Nice, written by Richard Bean. It was here that Anwar Akhtar, founder of the online platform the Samosa – which facilitates cooperation and discussions between Britain and Pakistan and the British Pakistani community – brought the work of Ajoka theatre company, and particularly Dara, to the attention of the National’s director, Nicholas Hytner. Taking an interest in the compelling and very current narrative of a moment for Pakistan and India when the seeds of partition were first sown, and the resulting religious schism which still reverberates today, Hytner commissioned for the play to be translated from Urdu and performed at the National. “It was a very brave commission by the National, and I think it is a moment of key cultural significance,” said Akhtar, who acted as a consultant for the production. “Britain has two million descendants of partition, so this represents so much of our British Asian communities’ own history and still has such relevance today. “This idea that there is one overarching, overbearing school of Islam is not the reality and crucially this play explores this multiplicity of the history of Islam. For the acclaimed Pakistani playwright Nadeem, Dara is a play that holds much more than simply entertainment value. It is central to his work as a campaigner for human rights and justice in Pakistan from the 1960s, which left him exiled for over 20 years. Indeed, grappling with disputes between the Salafi and Sufi forms of Islam, and exploring the extremist mullah ideology, it is a play that does not shy away from the issues currently overshadowing much of both the Arab and Asian Muslim world. “It is as much about contemporary debate in the Muslim world as it is about events of 300 years ago,” said Nadeem. “For Pakistan and south Asia, history is not just history – it is also present and it is also future because history affects us so overwhelmingly. “All of the present problems, they all owe their origins to the creation of Pakistan and to Indian-Hindu-Muslim heritage which actually took a very significant turn during the times of the events of Dara and which is the focus of this play. “So for us, Aurangzeb is not just a character from history but he is also the role model and prototype of the present day fundamentalist Taliban – he is still regarded by Islamic extremists as an icon. “In the history books in Pakistan, it is the Aurangzeb version of history which is projected and Dara has been relegated to a footnote. The journey to adapt and translate Dara took writer Tanya Ronder and director Nadia Fall to Lahore and across Pakistan and India, first to see the play in its original incarnation and then to visit the historical sites of Mughal India at the heart of the tale. The play has been an enormous success in both India and Pakistan, a fact Nadeem put down to particularly Pakistani audiences being “starved of meaningful and politically engaged entertainment on stage”. In a political climate of extremism, he said audiences had revelled in the more humanistic and more embracing depiction of Islam. Nadeem recalled the reaction of Ronder and Fall when they watched the first performance of Dara in Lahore, complete with an enthusiastic and vocal Pakistani audience. “They were amazed to see how the audience were very much of the play,” he said. “They were participating and punctuating the performance with loud applause and shouting, showing what they believed and what they have always wanted to be expressed but have never been given the chance. 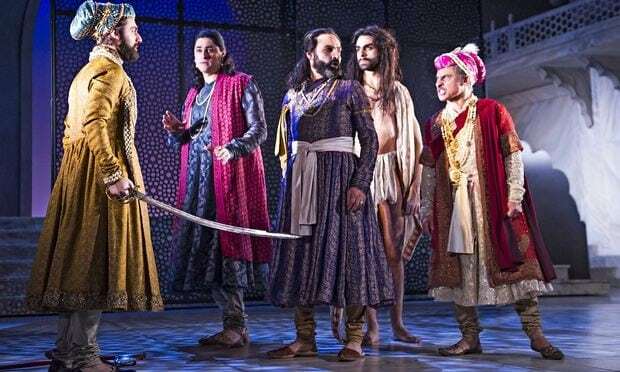 The process of adapting the play for a British audience unfamiliar with the story and ensuring the translation stayed true both to the story and the sensitivities around the issues of Islam was not without its challenges, said Nadeem. “In Pakistan we do not differentiate between different genres, so for us dance and music and comedy and tragedy are all part of our theatrical experience, whereas the National’s production is more Shakespearean in nature, with families, and sibling rivalries. Nadeem said he was thrilled to be able to bring to the west an accurate insight into the history of Islam and break away from negative western stereotypes of extremism, violence and fundamentalism. “No play written in the contemporary context will be as relevant and as contemporary as Dara is, because all the issues which began 300 years ago are still unfortunately unresolved,” he said. “In many Muslim countries the state or the rulers are still actively promoting extremism and violence and prejudice and this hatred for all non-Muslims. “And the fight against Islamic extremism, either in the west or in the Muslim countries from Isis or Boko Haram or al-Qaida or the Taliban, is as important for Muslims as it is in the west, so they are a common enemy.